The University of Plymouth is taking part in the trial of a ‘Sea Bin’ as part of the city’s ongoing commitment to tackling plastic pollution. 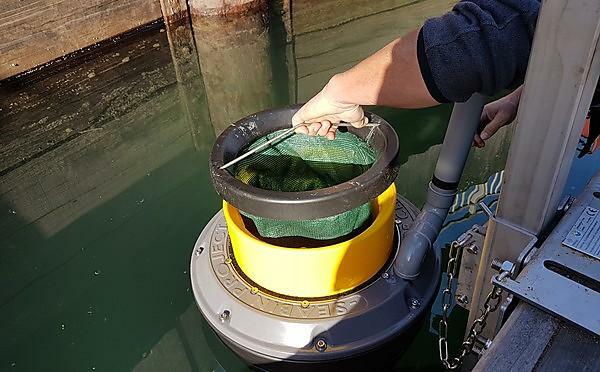 In a project led by Plymouth City Council, the device has been installed at the Queen Anne’s Battery Marina, close to the University’s own Marine Station. Researchers and students will be involved in the trial, monitoring collections of plastic and other waste to determine how beneficial it could be in Plymouth. A Sea Bin is a floating rubbish bin that can capture annually 90,000 plastic bags, 35,700 disposable cups or 16,500 plastic bottles. It is one of the latest projects to be developed to support the Plymouth Britain’s Ocean City Plan for Plastics, led by the city’s Plastics Taskforce, of which the University is a member. "Innovative developments designed to protect and enhance the environment are always welcome, the Sea Bin is no exception. Given the nature of plastics in the marine environment, efforts to remove them are imperative. I'm excited to see what the Sea Bin will bring to Queen Anne's Battery and Plymouth." The Sea Bin trial will report back at the end of September with some initial results.